Why invest in properties in Abu Dhabi? 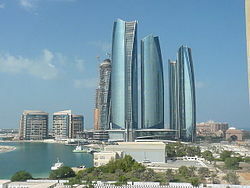 Abu Dhabi is the largest of the seven United Arab Emirates' members. It is the capital and the second most densely populated emirate in the UAE, just after the emirate of Dubai. It is politically and economically stable and it is also one of the fastest developing economies in the worldwide. Abu Dhabi is strategically and advantageously located between the three continents - Europe, Africa and Asia and besides, it has easy access to Middle East and GCC markets. Similar to Dubai, the emirate has tax-free economy and up to 100% overseas ownership in the Free Zones. Thus, many foreign buyers are prone to invest in properties in Abu Dhabi, due to its beneficial location, nice infrastructure, investment incentives and economic stability. Apart from all the economic factors, the emirate of Abu Dhabi is also one of the safest and most secure cities in the whole world​​​. According to the statistics of Mercer Survey, Abu Dhabi and Dubai are the best cities for living in the whole Middle East. Furthermore, the emirate has a hot desert climate. The weather in Abu Dhabi is so pleasant that there are 365 days of sun per year. There are summertime temperatures and sunny blue skies throughout the whole year. For all the above mentioned factors and reasons, many local and foreign buyers and investors decide to invest in the emirate, as with economy enlightening, investing in property in Abu Dhabi makes sense.